A reasonable guess of the weight in this period and locality in modern units is that 1 jin is 440 grams. A reasonable estimate of the volume in this period in modern units is that 1 dou is 3 liters. 羹臛法第七十六 Chapter 76: Methods for Stew and Broth. “One jin each of pork and sheep meat, one dou of water, boil until cooked. One sheng of ripe taro seeds — separately steamed — one sheng of the whites of scallions, add it to the meat and boil together, until cooked. Break apart four chicken eggs, pour them in, as you would cook [poach] chicken eggs in a soup. When they float, they’re cooked, so eat them. “Break open chicken eggs, the juice from salted fermented beans and salted fish sauce, and boil them together, until it forms a stew. It also says, “With the salted fish sauce boiling, add the juice from salted fermented beans, mix in scallion whites, and broken chicken eggs into the broth. Use chicken eggs, and nothing beyond these. Using a food board to chop and collect, mix the fish sauce and meat, and add water and boil as if you were making a stew. 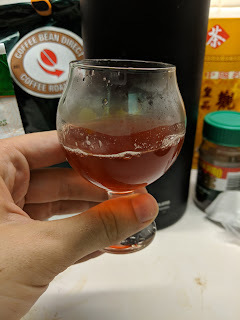 The Five Marquise's Method for Fish Sauce was requested, but the recipe is pretty sparse, so I'm including the two recipes that precede it. These are both ways to cook with fish sauce, not to make it. Fish sauce recipes are also given - these are fermented fish sauces that include salt, like Roman garum. A close approximation would be modern fish sauces from southern China and Vietnam. These sauces seem to have been replaced with soy sauces in northern China. Take 10 jin of mutton, ten jin of pork, julienne them, take three sheng of fresh ginger, five [“sheets/leaves” of] sourpeel tangerine (Citrus reticulata) peels, two sheng of stored gourds [Indofevillea khasiana, or more likely just pickled gourds], five sheng of onion-whites, join them together and pound them, making them into meatballs. Separate five jin of the sheep and braise [sear and simmer in its own juices] it, and then below the roasting spit boil the meatballs. This is how you make meatballs. Take one dou of sour rice water [possibly instead, Physalis alkekengi], and boil it down to seven sheng. Take one sheng of glutinous rice and add it to the broth, and after some time lower the fire, like making porridge. In june, soak one dan of flour, and add two sheng. In winter, add four sheng. Take seven or eight sheng of white rice, and make a porridge. Use six or seven sheng of white [rice] wine lees, and add to a fire. When the wine boils with bubbles the size of fish eyes, press off the dregs, and add the flour. When the dough rises, you may bake it. Take Two jin of mutton, one ge of onion heads, salted fermented bean juice and salt and stir-fry until done and then bake it. “It’s customary to on one day of two festivals place Proso millet inside the leaves of wild rice (Zizania latifolia), take the juice from pure thick ashes and boil them, until well cooked. Eat these on the fifth day of the fifth month [the Dragon Boat festival], or on the summer solstice. Another name for glutinous millet is “zong,” or “horned millet.” Undoubtedly, this is the image of yin and yang mutually surpassing each other and not yet having been separated inside. First take rice [probably dry-field short-grain and/or glutinous, although other varieties also possible] and soak them to clarify. 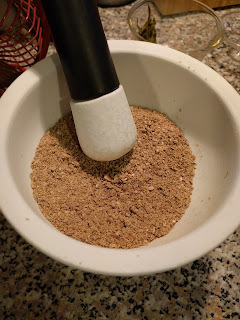 Take perhaps 20 sheng of rice, one dou of rinsed clean Setaria millet, and put it within a bamboo tube, the rice together and the millet together, inside, and use a rope to truss it up. Make the trusses 1” apart. You must boil it in a wok, and you can cook ten dan of grain in it, until the tamales are cooked. Make salt water, making it very salty, and wash the vegetables in the salt water, and then put it into a weng [an urn]. If you wash with fresh water, the pickles will rot. As for the washing of the vegetables in salt water, when it clarifies, pour it into the weng, just to cover the vegetables, do not re-harmonize them. While the pickles are still green, use water to wash off some of the salt, and boil it to eat, and eating them with fresh vegetables is not peculiar. For the field mustard and the Shu mustard, ladel them out after three days. Make porridge-clear [the clear, starchy liquid that accumulates on top of porridge] out of proso millet powder. Pound wheat/barley corns to dust, and sieve it through a thick tabby-woven silk cloth. Spread the vegetables as a group, and dust them with the flour, and then add them to the cooked porridge-clear. Layer them repeatedly like this, and fill the whole weng. Every layer must alternate stems and leaves. Still add the old salt water to the weng. When the pickles are yellow, the flavor will be good. To make mild pickles, use Proso millet porridge-clear, and wheat/barley flour, and the flavor will also be excellent. Take good cabbage, and field mustard. Take the good vegetables and pick them over, and blanch them in hot water. If the vegetables are already wilted, wash them in water, drain them, and freshen them overnight, and then blanch them. After blanching, rinse them in cold water, and add to salted vinegar. Fry in sesame oil, and they will be fragrant and crispy. If you make a lot, it should last until the spring without spoiling. One said, it’s pronounced [this way], and “niang means pickles.” Use dry field mustard [leaf or seed unclear], and make it on New Year’s day. Soak the vegetables in hot water until soft when cold. Tear off leaves, and join [plait, weave?] them, selecting well, and then wash them clean. Blanch in boiling water, immediately take them out, and then wash again in water, and as before put the vegetables in a batch of salt water, and put them out on a bamboo screen. Pass a night, and the color of the vegetables will have improved. Take Proso millet flour porridge-clear made with barley [possibly wheat] bits sifted through thick tabby-woven silk. Irrigate the the pickle vegetables, as in the previous recipe. Then, the porridge-clear won’t require a great heat. When the liquor is just cold, immerse it, not using too much. Seal the head [of the vessel] for seven days, and then it will be done. Wrap the pickling weng [jar] in straw, as you would to make wine. One interesting thing about these pickles is the addition of starch. Pickling relies on acid to sour the pickles and preserve them. Some pickles just add a bunch of vinegar. Others rely on fermentation to produce lactic acid from starches in the vegetables - sauerkraut does this. These pickles are doing that, but also adding starch to make the process go faster, more sour, and more reliably. This is so exciting I can hardly stand it. I want to make them all! I see a feast coming! But that's what they are! ... basically. I write with my friends as my intended audience, and my friends know Mexican food enough to know what a tamal is. Hey Alec! Garrett here, Kasia Gromek's friend who asked for all this fantastic translation help. I've got plenty of pictures from the four recipes I used along with my own notes. How best would you like me to share them?